If you are looking for a place to go on holidays with the whole family, know that the Costa del Sol offers several towns that are worth a visit. In this post, we are providing you with useful information about what to do and what to see in Benalmádena. Benalmádena Pueblo, the original village and the most authentic part of the town, being provided with whitewashed houses and narrow streets typical of the White Towns. Arroyo de la Miel, between Benalmádena Pueblo and Costa, it’s the residential area. Its name, which means “The Honey Stream”, is said to come from a famous sugar and cane honey factory, whose sewage waters were sweet. Benalmádena Costa, where hotels, shopping centres, discos and tourist attractions are located (the Marina taking the cake). You can reach the town of Benalmádena from Malaga by bus. The bus line M-110 (Málaga-Torremolinos-Benalmádena) stops at the Train Station of Malaga María Zambrano until the stop of Torrenueva in Benalmádena. The ticket costs €1.70, and it takes 45 minutes. If you’d rather go by train, the cercanías C1 brings you from Malaga (City centre, Train station and airport) to Benalmádena. It takes half an hour, and the tickets cost €2.05. The Phoenicians were the first to reach the area, where they developed agricultural and cattle techniques. Then the Romans get to Benalmádena, and they left several vestiges, such as the saltings factory in Benal Roma, and other smaller installations in the areas of Capellanía and Torremuelle. After the Romans, the Arabs are said to have given the area the name of Ibn al-ma’din, which literally means “Sons of the Mines”, due to the high quantity of mineral deposits found in the area that date back to the Roman times. Curiosity: from this period is the mosaic that is currently kept in the Alcazaba of Malaga. During the Arab kingdom, the castle of Benalmádena was its major defence. After the fall of Marbella (1485), the Catholic Monarchs headed towards Malaga, thinking that the towns on the way were to surrender easily. However, Benalmádena stood up for itself, and it took a while before its castle got destroyed and the town conquered. In 1491, the Catholic Monarchs gave the Carta de Privilegio (Privilege Charter) to Sevillian Alonso Palmero for him to have the castle rebuilt and the town repopulated with 30 Christian families. Palmero thus converted in the first Christian mayor of Benalmádena. In the following decades, Benalmadena became one of the defensive posts against the pirates of Northern Africa, thanks to the renovation of the Nasrid towers Bermeja and Quebrada, and the construction of the new Torremuelle. After a period of epidemics, the town of Benalmádena also beneficiated from the boom of mass tourism on the Spanish coasts in the 1950s. 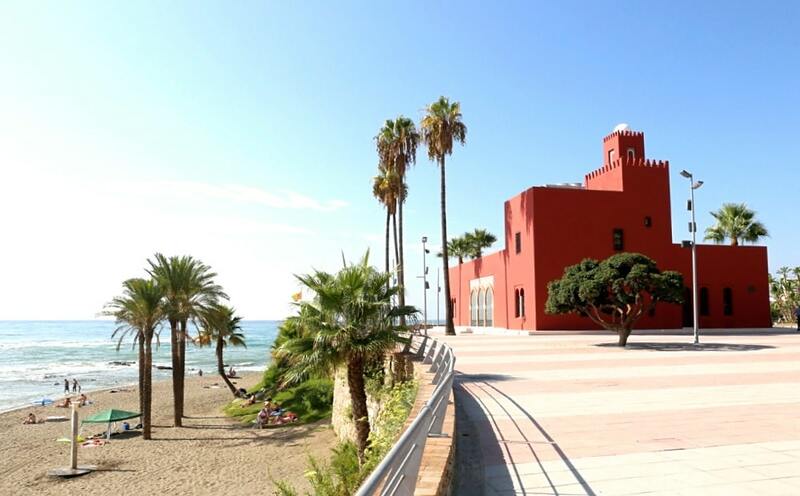 New leisure areas were built, and nowadays Benalmádena is a point of reference for tourism on the Costa del Sol. Benalmádena is one of the favourite destinations of foreign tourists (who also end up living here). 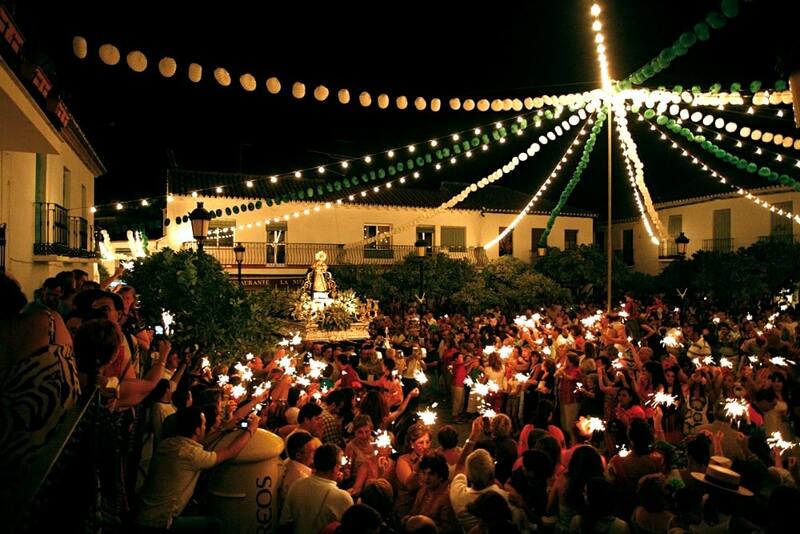 Therefore, its streets are filled with contrasts between the most unwavering Spanish traditions (such as the Holy Week) and the traditions belonging to foreign cultures (such as the Association of the Veterans belonging to the British Legion). For this reason, you should keep your eyes open during your getaway to Benalmádena, and try to soak up the peculiar atmosphere as much as you can. One of the symbols of the city is the “Niña de Benalmádena”, a bronze statue of a girl that has been overlooking the Plaza de España since the late 60s. It was made by Jaime Pimentel, and it forecasts the resurgence of the local economy thanks to tourism and international culture, displaying the friendliness of the inhabitants of Benalmadena towards the visitors. A copy of the statue, which represents a little girl carrying a shell with water in it, was given as the prize for the winner of the “Festival de Cine de Autor de Benalmádena”. A replica of the statue can be admired in Bruxelles, which symbolises the twinning between the two cities. If you want to see hidden treasures, don’t miss out on the Archaeological Museum, where you can see a collection of pre-Columbian pieces, gifted to the town by Cuban painter Felipe Orlando once he moved to Spain. Curiosity: the marble statue of Diana that you can find in the museum was found after a vessel wrecked in front of the coast of Benalmádena in 1855. The vessel was carrying marble statues from the Italian city of Genoa to Calcutta. The fortifications of Benalmádena are fairly famous, too. The Castle of Colomares, built in 1987 as a homage to Cristopher Columbus and the Discovery of America, is provided with spectacular sea views and it features Renaissance, Mudejar and Gothic elements. Although its 1,500 cubic metres have converted it into the world’s biggest monument dedicated to the explorer, in its interior, you will find the world’s smallest chapel, dedicated to Saint Isabel from Hungary. Its mausoleum is still empty, waiting for the mortal rests of Columbus to be taken there. The Castle of Bil-Bil, on the contrary, was built to be a private house of a wealthy French family in the 30s. After passing from one family to another, it was finally bought by the City Council and thus converted into an exhibition and art centre, where weddings are celebrated, too. 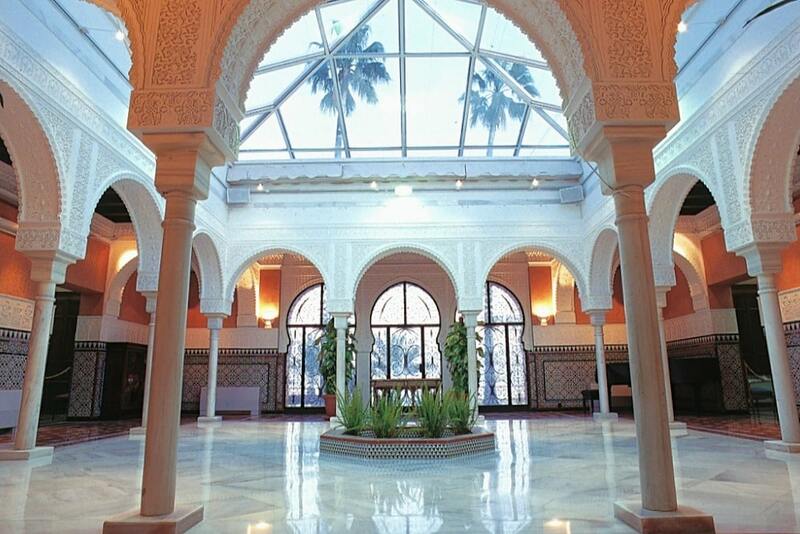 In fact, the Castle is the place where the highest number of marriages are celebrated in the province of Malaga. 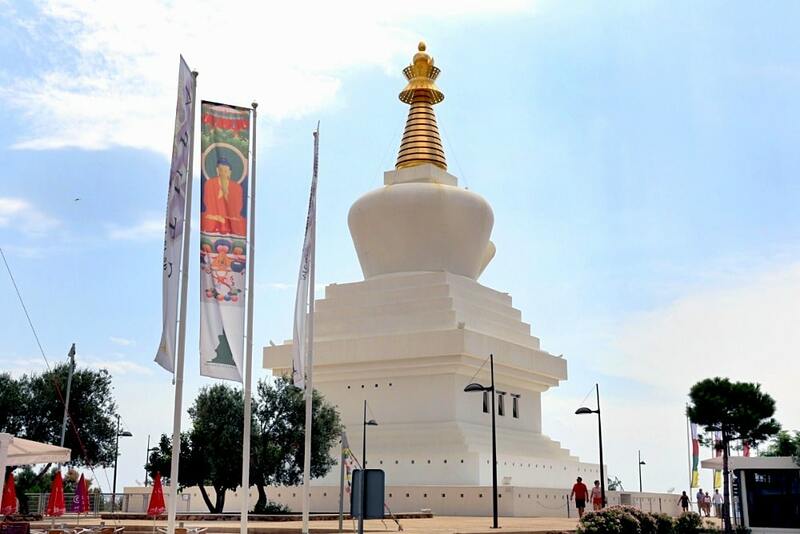 The 33-mt-tall, Buddhist monument “Enlightenment Stupa of Benalmádena” was inaugurated in 2003 and it’s dedicated to the harmony of the world, prosperity and peace. The spiritual guide is 17º Gwalwa Karmapa Tinley Thaye Dorje and the activities are directed by the Asociación Cultural Karma Kagyu de Benalmádena (Cultural Association Karma Kagyu of Benalmadena). Following the Buddhist teachings, there are eight types of Tibetan Stupas, each of which has to be built with exact proportions and each represents an important event of Buddha Shakyamuni’s life. The Stupa of Benalmadena symbolises the illumination of Buddha, the awakened mind. Besides, it’s Europe’s biggest Stupa and, unlike others, it also features a meditation hall. The Stupa lies in El Retamar, in Benalmádena Pueblo. The bus line L2 (to Benalmádena Pueblo), M112 (to Mijas), M121 (to Mijas) stop at “Estupa Tibetana”, right next to the Stupa. Benalmádena’s oldest church is set in the splendid square of Santo Domingo, near the Jardines del Muro. The church dates back to the 17th century, but it has undergone a complete renovation. The gardens, which were designed by Canary Islander artist César Manrique, and the square are a spectacular viewpoint to spot the whole town, the sea and even the African Coast during the clearest days. 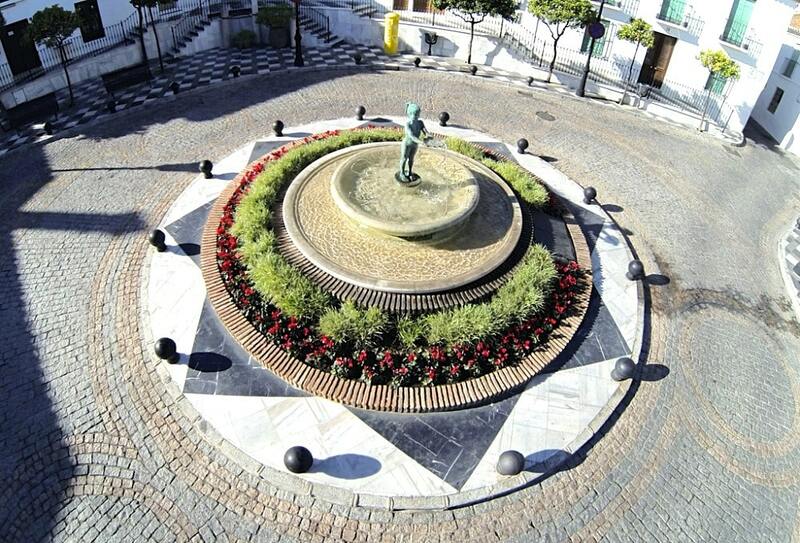 To reach the square, you can either enjoy a stroll from the lower part of Benalmádena, or make use of the free elevator from the parking lot in El Chorrillo area. Being located only 11 km from the airport of Malaga, Benalmádena offers several activities and places to enjoy. It’s perfect for all visitors to make the most of their stay. 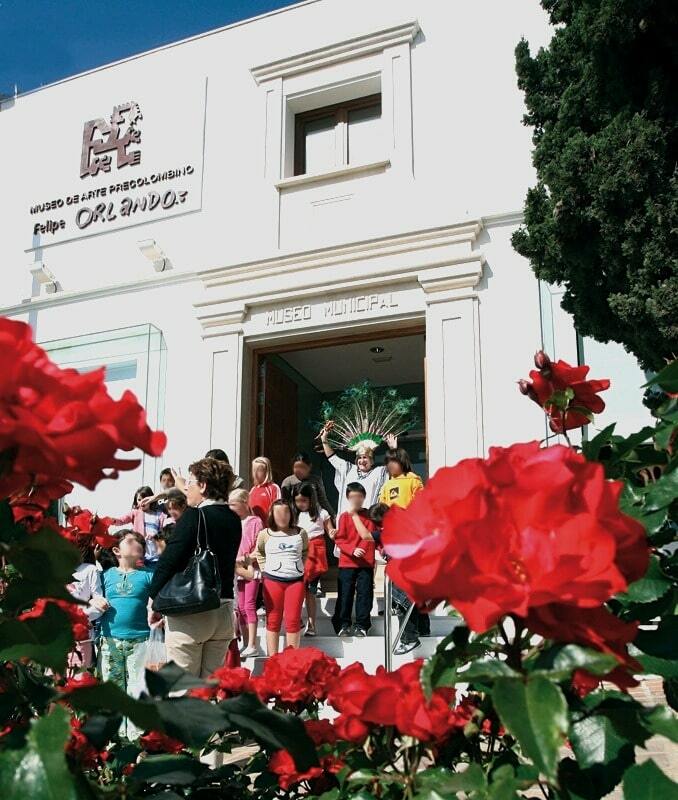 And if you travel with children, take a look at this post about what you can do with children on the Costa del Sol. 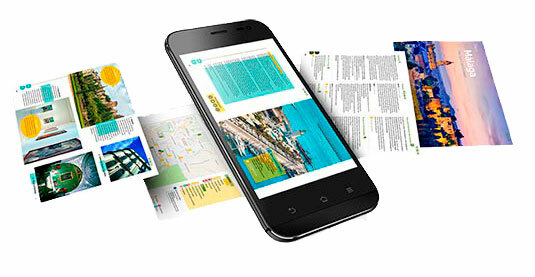 You’ll find that Benalmádena has a few resources, too! The development of the area has provided Benalmádena with important infrastructures, such as Puerto Marina, the Tivoli World (one of Spain’s first fun parks), or the casino of Torrequebrada, inaugurated in 1980 and one of the most popular of the area. Puerto Marina is one of the most spectacular residential and port complex in the world. Its architecture is peculiar and charming, and its installations exemplary. 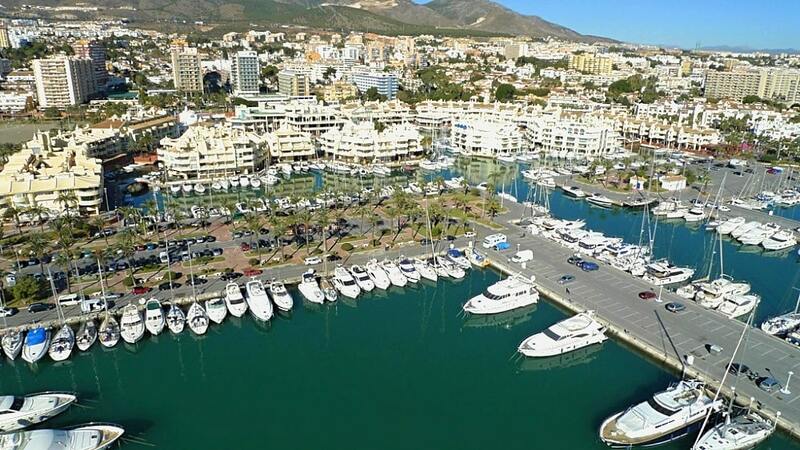 It’s been awarded as the “Best Marina in the World” several times also because of the 1,100 moorings for boats, and it’s been awarded the Blue Flag since 1987. Also thanks to the weather (the annual average temperature being 22ºC), the Marina hosts several events and activities throughout the year. Besides, it even welcomes Sea Life Benalmádena, an aquarium with conservation programs where you will have the chance to know the life underwater. Click here for more information about the opening hours. 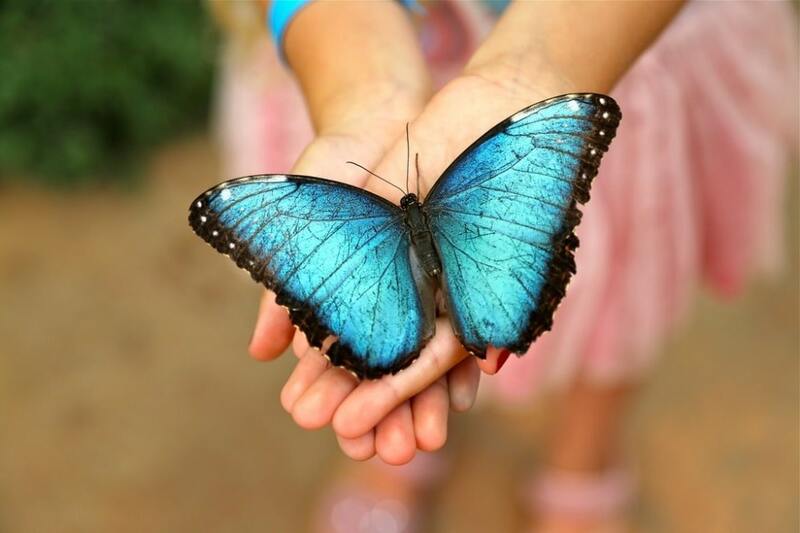 The Butterfly Park of Benalmadena is Europe’s biggest space entirely dedicated to butterflies. It’s located in a Thai-style building, whose materials were imported directly from Thailand. The Park is located next to the Stupa, with which it creates a conceptual harmony. 1,500 exotic butterflies, belonging to 150 different species from around the world, live in a glazed, 900-sq-mt garden. 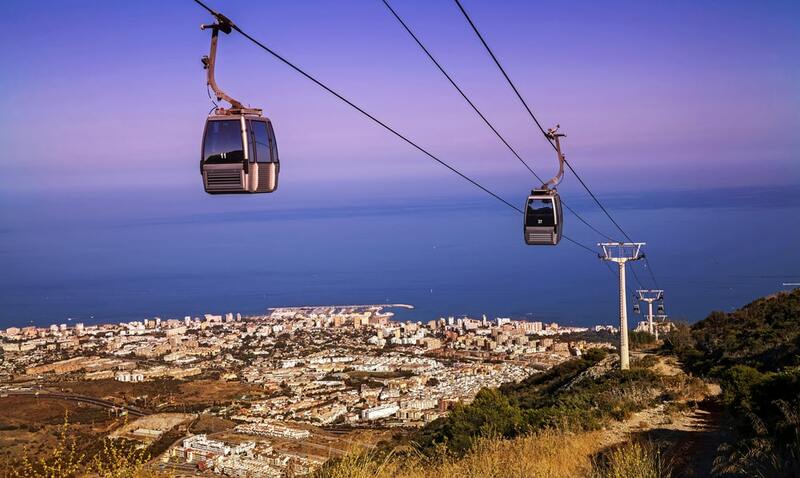 The Cable Car of Benalmádena, known as “Teleférico” leads from Tivoli Park up to Mount Calamorro, 771 metres above sea level. From here, enjoy spectacular views of the sea and make the most of the hiking (and MTB) routes. You can buy the tickets online, thus saving some money. The round-trip costs €11.90 for adults, and €9.50 for children, seniors, and people with reduced mobility. Regarding the opening hours, check the official webpage of Teleférico Benalmádena, where you will also see when the exhibition of predatory birds takes place. The latter activity is a must for animal lovers. This Birds of Prey centre is set in the surroundings of the Castle of Colomares and it runs breeding and recovery programs for up to 160 birds of prey, such as owls, falcons, vultures and, of course, eagles. 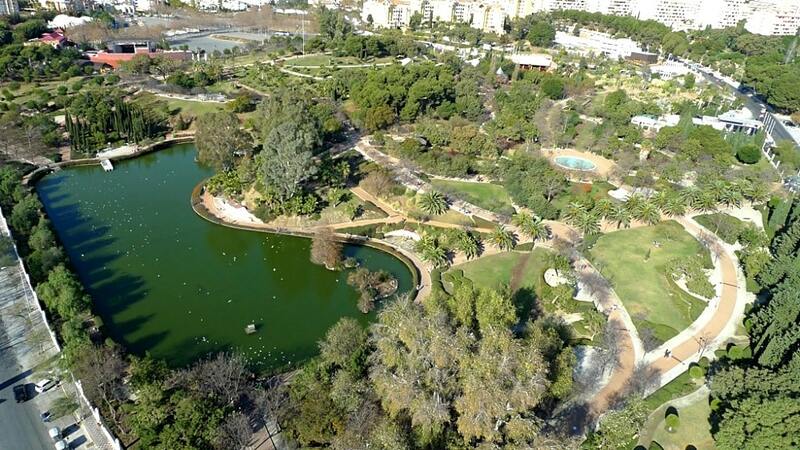 The maritime park of Andalucia provides visitors with useful information about the maritime wildlife that lives there (dolphins, sea lions, penguins, flamingos and reptiles among others). They are also part of various conservation projects, aiming at the preservation and defence of wild animals. Take a look at the opening hours and tickets by clicking here. Tip: you can buy a €36 Selwopack granting you access to Selwo Aventura in Estepona, Selwo Marina and the Cable Car. Located near the Selwo Marina Park, you’ll find the 200,000-sq-mt Park of La Paloma (the Dove), which was inaugurated in the mid-1990s. Several species of animals, such as rabbits, peacocks, ducks, donkeys and so on, live in the park among the lakes that compose its landscape. Children parks, cafes and kiosks are also present in the park. What: delicious seafood at lower prices. Drinks at €1.50 and seafood from €1.50 to €7 (prawns). What: cultural activities and theatre, music and dance shows. What: 60 stalls offering Arab products, workshops, live dances and music, from 11.30 am to 2.30 pm, and from 5.30 pm to midnight. Now that you know what awaits you in Benalmádena, you should take a look at the best holiday rentals where to stay on the Costa del Sol and in town.